Record Android Screen is something Android users want to learn to basically start their Channel and make some cash. But they end up finding Best Screen Recorders and don’t stick with one to explore its best settings to record screen at the next level. Yes, it’s true that not all the screen recorders can provide you every feature that needs to recorder screen comfortably. And according to my Experience, I have found that Du Screen Recorder works best compared to any Screen Recorder available in the App store. No screen recording app can beat Du Screen recorder in terms of feature and recording quality. It has almost everything you will need to Record Android Screen perfectly. Even, you can edit your recorded video on Du Screen Recorder. Means, now you don’t need to purchase a bundle of Video editing app from the Google Play store to edit like a pro. Du Recorder has essential to premium features in its video editor available for free. Well, in this article I will dig deeper into the screen recorder and provide you some cool knowledge along with a guide to Record your Android Screen with Du Screen Recorder. Let’s get started. 0.1 What is Du Screen Recorder and What it Provides? 1 How to Record Android Screen Using Du Screen Recorder? 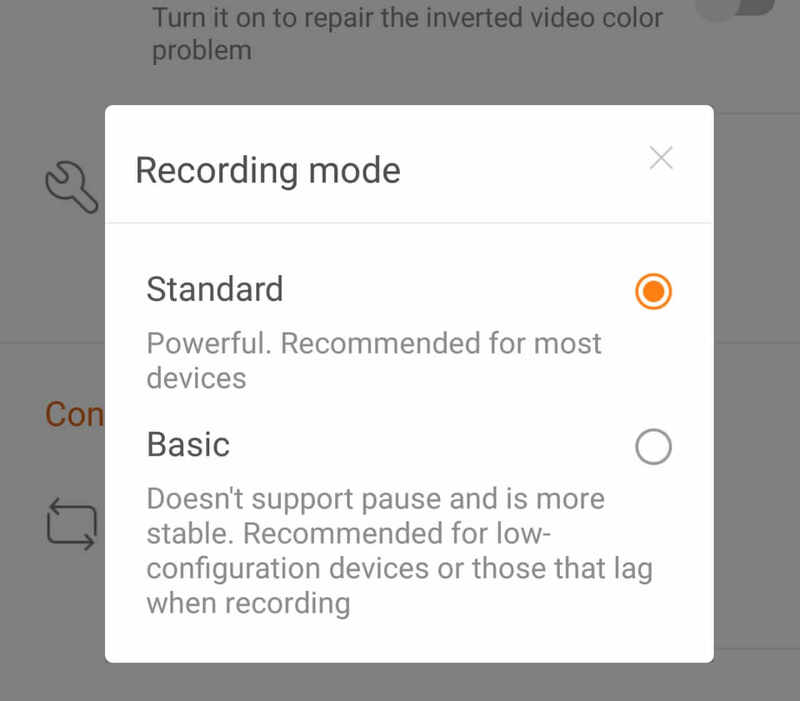 1.1 How to Record Android Screen in Low-end Phone Using Du Screen Recorder? What is Du Screen Recorder and What it Provides? Du Screen Recorder is a free screen recording app that allows Android users to record their phone screen with ease. It provides recording options in a vast amount to its user. From Video settings to add your own watermark on your recorded video. It doesn’t add their own. Even it lets users add their own watermark. Du Screen Recorder provides very useful recording tools including taking Screenshot, Enable front Camera, Record GIF, Show touches, and more. The control settings in the recorder have also very useful options like Recording mode, Hide the record window when Record, Shake phone to stop recording, Disable pop-up notification after screenshots, Countdown, Hide the recording button on Homepage, Keep recording when Screen is off, And pause recording for incoming calls. Moreover, you can live stream using Du Screen Recorder, it has its own Live streaming section where Du Recorder users can watch and subscribe to the channel if they want more streaming in the future. It’s very similar to Youtube live streaming. So, whether you need a screen recorder, want to live stream, Edit a recorded video, all can be done with Du Screen Recorder. Now, let me explain some of its awesome features. The recording mode is something low configuration device owner can take advantage. With Recording mode, you can select a recording mode for the low-end device and high-end device. Most of the Low-end Android users struggle in finding a lightweight screen recorder for their Android. And this thing Du knows and that’s why it has provided an option for low configuration Android that will help them to record screen. I will later guide you in this article on how you can record screen in your low-end Android phone. If you ever let get wasted another recording due to an incoming call while recording then this feature in Du Screen Recorder will help to tackle it. Pause Recording for Incoming calls is a feature that will help pause the recording until you end the call. And through this, your recording will not get wasted. It’s much irritating actually when an incoming call comes while recording screen for important work. Because when it comes, the recorded tape gets wasted and you will need to again record it with the same steps that will feel irritating. Du Screen Recorder comes with a great UI crash repairing function that instantly fixes the crash whenever happens during recording. In some Android phone, sometimes no screen recorder works, it continuously crashes. In case, you can use the Repair System UI crash feature in Du Screen Recorder to repair and start recording screen of your Android phone. This one is really a great recording tool that Du Screen Recorder has implemented in the recorder under the Recording tools section. Once, it enabled you can instantly take the Screenshot of your Android and it doesn’t matter which window is displaying in Android. Sometimes, you cannot take a screenshot of a window showing in Android like debit card number in PayZapp wallet app. But with this feature, you can take a screenshot of any window displaying in Android. So, these are the four best features of Du Screen recorder that I found useful and rare. Now, let me show you how you can record your Android screen with the recorder. How to Record Android Screen Using Du Screen Recorder? First, download and Install Du Screen Recorder from Google Play Store. Click on it from App drawer to open it up. Once you tap on it you will get a floating orange circled icon. Tap on the floating icon from the Android screen side. And then click on the second option from four options. Now, you are in Du Recorder. To go to the settings by tapping on the gear icon that placed at the fifth position in the top menu. 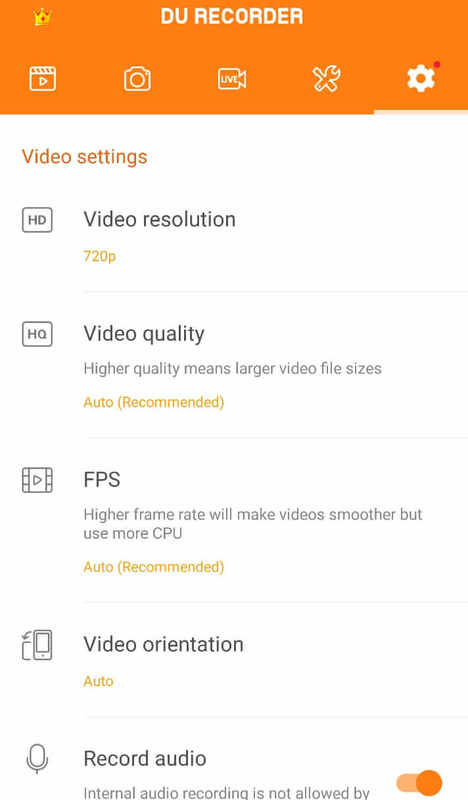 Under video settings, set Video Resolution which suites perfect to your device and let video quality, FPS set on Auto. Now, you are done the basic settings. Go back to your Android home screen and again tap on the floating icon. From the floating icon, select the first option that is recording option. When your first-time record, it will show you a notification which aims to prepare you for recording. Just tick mark Don’t show it again and Press start now. A 3secs countdown will start and after the recording begins. Use the floating icon to pause and stop recording. Once you are done recording your video, just stop it from the floating icon. And the recorded video will automatically get saved to your Android phone storage. With these steps, you can start recording your Android screen using Du Screen Recorder. Now, as I little said above that I will provide you steps to record screen in your low-end device, let me complete my promise and provide you the guide. How to Record Android Screen in Low-end Phone Using Du Screen Recorder? First and foremost, install the Du Screen Recorder in your low-end Android phone using Google Play Store or any third party site. Or if you already have it then make sure it’s updated to latest version. Check out this guide for steps, How to Download, Install, and Update App on Google Play Store. Tap on the Du Screen Recorder from the App Drawer. Once you click, an orange floating icon will start appearing at screen edge. Click on the Du Recorder floating icon and click on the second option to open the Screen Recorder. Tap on Gear icon and scroll down to Control Settings. Under control settings, tap on Recording mode and change to basic from Standard and close it. Now, go back to your Android home screen and again tap on the floating icon. And select the first option which will start the recorder after the 3secs countdown. Now, you will see that the recording is started without lag. With these easy steps, you can start recording screen in your low configuration phone. The basic mode of Du Screen recorder requires the least Android resources which results in successful recording even in low-end Android phones. In the App store, you will find plenty of screen recorders with a high rating and when you use them, you will find most of them useless. I have experience in that field of around 1 and a half years, I have done Youtube for a decade and that’s why I know much about screen recorders. As of now, Du Screen Recorder is the best Screen recorder available for free on Android’s app store. And trust me or not, it will help you recording screen in your low-end phone without any lag. The technology it has is just great which enables it to capture screen in any Android phone efficiently. If you still want me to talk more about this screen recorder then the comment is open. Hopefully, you’ve learned to record Android Screen using Du Screen Recorder? If so, I appreciate if you share this article with your friends and make sure you let me know your thoughts in the comments below.